Dry eye is an extremely common problem, especially as people get older. It is estimated that 10 million people in the U.S. suffer from some degree of dry eyes. It can be caused by an impaired ability to produce sufficient tears or by ocular surface inflammation that leads to plugged oil glands. Also, if oils do not easily get blinked from the eyelids onto the eye, the tears evaporate more quickly off the eye surface. The tears are the eye’s natural lubrication, so having them evaporate quickly can lead to dry eyes. Aqueous tear-deficient dry eye – This happens when there aren’t enough tears produced. Age is one of the main risk factors for this type of dry eye. Other factors that play a role in the development of aqueous tear-deficient dry eye include: certain oral medications (antidepressants and bladder control medicines in particular), use of certain toxic ingredients in makeup, rosacea, autoimmune conditions, and dietary factors that raise inflammation. Evaporative Dry Eye – This is the most common type of dry eye. It occurs due to poor quality oils being produced such that the tears evaporate too quickly off the surface of the eye. The oil glands, or meibomian glands, become inflamed and plugged. They secrete a thick paste instead of a clear liquid oil. This leads to very fast evaporation of the tears in between blinks. Instead of being moist and lubricated, the eye surface becomes dry and rough. This causes blurry vision, irritation, and a gritty or sandy feeling in the eyes. One of the leading causes of dry eye syndrome is the malfunction of the Meibomian Glands. These are tiny vertical structures located inside the eyelids responsible for producing the oil that protects the eye surface. There are about 30-40 meibomian glands in the upper and lower lids. The eye uses this oil to prevent the tears from quickly evaporating between blinks. On average we blink every four to six seconds, but this rate goes down to one or two blinks per minute during certain visual tasks (like reading, or looking at a computer monitor). Because of this, it is important for these glands to be working properly. The meibomian glands allow for comfortable clear vision. Along with insufficient tears being produced due to meibomian gland dysfunction, dry eyes can also develop due to the oil glands becoming plugged. When this occurs, the crystal-clear healthy oil that is usually secreted with each blink gets replaced by an opaque toothpaste-like secretion. This poor-quality oil is not as effective at maintaining a healthy moist eye surface and results in dry eyes. When one of the meibomian glands gets severely plugged, the eye can become painful and an eyelid stye can develop. Typically, symptoms of dry eye are worst at the end of the day. However, some people also experience significant eye discomfort upon waking up in the mornings. When severe and left untreated, dry eye syndrome can break down the eye’s superficial tissues and lead to infections. Dry eyes can lead to many other conditions that result in eye irritation. One such condition is trichiasis. This happens when eyelashes poke the eye and cause irritation. The growth pattern and direction of eyelashes can become abnormal due to chronic inflammation of the eyelid, also known as blepharitis, or due to previous trauma, injury, or a tumor. Sometimes lashes will turn inward and rub the eye surface causing significant eye irritation and pain. Rather than plucking out these problematic lashes, which will only delay the problem from happening again, Dr. Schiedler may recommend using electrolysis to permanently remove the eyelash. A very fine needle is inserted down the shaft of the hair follicle, and then a tiny electrical current is applied to destroy the lash follicle. This may need to be repeated since the hair follicle has different growth stages and it is important to eliminate problematic lashes that were in dormancy during the first treatment. If a large number of lashes are problematic, surgery may be a better option. Dr. Vivian Schiedler can help you determine which approach would be best for you. There are countless remedies that can offer relief from the eye irritation caused by dry eye. If your dry eye condition is not severe and you are only suffering mild symptoms, there are at-home treatments that can help reduce or eliminate dry eye symptoms. Dr. Schiedler will help guide you in selecting the best dry eye treatment option for you and your needs. She will also perform an exam to determine the quantity and quality of your tears. For those dry eye sufferers who have failed to find relief despite trying different treatments, broadband light may be right for you. Broadband light delivers a very intense bright flash of light with a special filter to target the blood vessels in the face and eyelids. It reduces inflammation long term and kills any mites that have burrowed into lash follicles and oil glands. Ultrasound gel is applied to the skin, and the device’s small clear sapphire crystal keeps the skin cool and protected. When treating the eyelids, special metal laser shields need to be inserted under the eyelids to protect the eyes. Without this special protection, the light energy can damage the structures inside the eye. Only very few medical physicians can perform this treatment on the eyelids, and Dr. Schiedler is one of those few. You can count on her, as she is well-trained at using BBL for dry eye treatment. Dr. Schiedler treats the entire face and eyelids, and usually recommends three sessions one month apart to achieve the best results. Patients often notice significant improvement after two sessions, but it is important to go through the whole treatment in order to fully reduce inflammation and obtain a longer lasting effect. 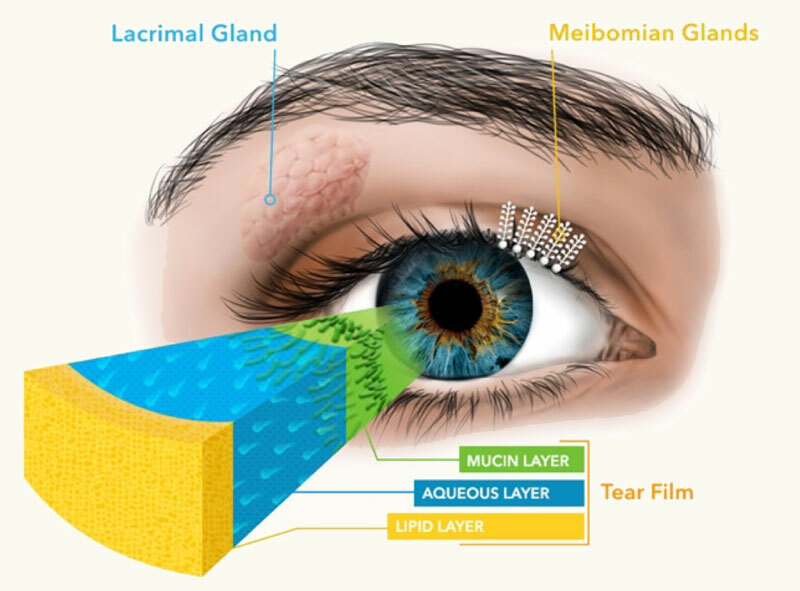 About 80 percent of people with dry eye caused by meibomian gland dysfunction will experience considerable and long-lasting relief from their eye symptoms after BBL. It may need to be repeated once or twice a year depending on any underlying rosacea or ocular surface inflammation. Dr. Schiedler strongly believes reducing inflammatory foods in the diet can be helpful as well. Parabens – This preservative prevents the meibomian gland from functioning properly and may cause or worsen dry eye. Prime yellow carnauba wax – Found in some mascaras and eyeliners, this common ingredient in waterproof products has been known to clog the oil glands. Nickel and chrome – These are metals that are commonly known to cause allergic reactions and can lead to dry eye and a host of other problems. Retin-A (tretinoin) – Although extremely popular for its anti-aging properties, retinol derivatives can cause damage to the meibomian gland and should not be applied too close to the eyes. If you suffer from dry eye symptoms that are causing eye irritation, contact eye specialist and oculofacial plastic surgeon Dr. Vivian Schiedler at Oasis Eye Face and Skin. She will work with you to devise a treatment plan that will help eliminate your dry eye syndrome and restore eye comfort. Schedule a consultation today by calling 541-500-0165 to get started.